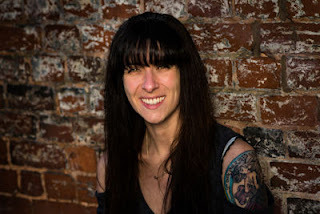 Please welcome Lucy Banks to The Qwillery as part of the 2017 Debut Author Challenge Interviews. The Case of the Green-Dressed Ghost was published on March 7th by Amberjack. Lucy: Thanks for having me here! I think I was always a bit of a compulsive writer – I’ve got diaries going back to when I was nine years old. Over time, that progressed into writing novels, though the first ones weren’t very good. The other day, I found one I’d written when I was 20, and it really made me wince. But, we’ve all got to start somewhere, haven’t we? And thankfully, things have improved a lot since then! Lucy: I like to imagine I’m a plotter, though I think it depends on the story. Sometimes, if the characters are strong, it’s easier to let them take over and tell the stories themselves. I’m not sure I could ride entirely by the seat of my pants, I think I’d be too worried that I wouldn’t be able to think up a satisfactory ending – but I have a lot of respect for those that can. Lucy: Finding the time, definitely. I’m a new author, so I still have a day job, and I’m a mother of two young, boisterous boys. It’s hard not to feel guilty writing when you have a chorus of little voices asking why you’re not playing with them! Lucy: First and foremost, other great writers. 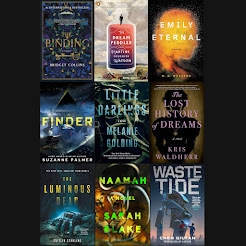 I read novels by Neil Gaiman, Margaret Atwood, Stephen King, JK Rowling, and I’m just blown away by their ability to create these immersive, believable, captivating worlds. From an early age, I used to read and think ‘one day, I want to be able to do that’. Other than that – great teachers at school, creative friends… I’m lucky, I’m surrounded by amazing, talented people, who are a constant inspiration. TQ: Describe The Case of the Green-Dressed Ghost in 140 characters or less. Lucy: Kester heads to Exeter to find Dr Ribero, but finds his father and a supernatural agency instead, plus a murderous, malevolent spirit. Eep! TQ: Tell us something about The Case of the Green-Dressed Ghost that is not found in the book description. Lucy: Dr Ribero’s supernatural agency are inept and rather short on cash, so use water bottles to trap spirits (they simply can’t afford state-of-the-art equipment). It’s not too much of an issue, unless they accidentally throw the bottles out for recycling! TQ: What inspired you to write The Case of the Green-Dressed Ghost? Lucy: A few things, really. I grew up in a fairly strange house (plenty of people liked to say it was haunted) – so I wanted to write a book that normalised the supernatural – because that’s what was normal for me. The character of Dr Ribero was actually conceived in a writing class in Exeter, though originally, he was investigating rhubarb theft, not dangerous spirits. TQ: What sort of research did you do for The Case of the Green-Dressed Ghost? Lucy: My office is overflowing with books on the occult – my friends come over and probably imagine I’m a complete weirdo! However, it’s great fun diving into them and finding out about obscure spirits. Exeter Library is also a popular haunt of mine, particularly for books about the local area. All the Dr Ribero books are set around South-West England, so it’s a great place to find out information. And of course, Google is always incredibly handy. 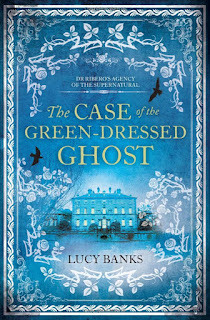 TQ: Please tell us about The Case of the Green-Dressed Ghost's cover. Lucy: The house on the front cover refers to a key location in the book… the place where the green-dressed ghost is misbehaving, and where Dr Ribero and his crew spend plenty of time trying to get her out. 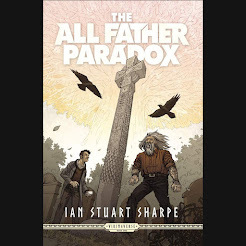 My publishers were looking for something that also highlighted the gothic / Sherlock Holmes edge to the story – although it’s a light-hearted book, there’s a strong element of mystery and a few spooky parts. However, whilst it does give a nod to the great Sherlock Holmes, it’s fair to say it’s probably a little bit ‘Scooby Doo’ and ‘Ghostbusters’ in places too! TQ: In The Case of the Green-Dressed Ghost who was the easiest character to write and why? The hardest and why? Lucy: For me, writing the characters was definitely the most fun part. The main character (Kester Lanner) was particularly easy – because he’s essentially a male version of myself in my early twenties! Slightly socially inept, a bit bumbling, likes a good mystery… and is obsessed with books. The characters of the spirits were obviously a bit more challenging, particularly as I wanted to break the whole wailing, moaning, transparent, floating ghost stereotype. That took a bit more plotting, though hopefully I got there in the end. TQ: Which question about The Case of the Green-Dressed Ghost do you wish someone would ask? Ask it and answer it! Lucy: Why do they drink so much tea? Answer – everyone I know drinks tea. It’s immersed in our culture – all events are invariably begun with the golden question, ‘do you want a cup of tea?’ Ironically, I don’t drink it myself, but I’m partial to a herbal tea or two, especially if it comes with an accompanying biscuit. TQ: Give us one or two of your favorite non-spoilery quotes from The Case of the Green-Dressed Ghost. Lucy: The second book in the series is due for publication early 2018, and I’m currently polishing the third /writing the fourth as we speak. Lucy: Thank you, I’ve enjoyed answering your questions! After teaching English Literature to teens, Lucy set up her own copywriting company and turned her love for the written word into a full-time career. 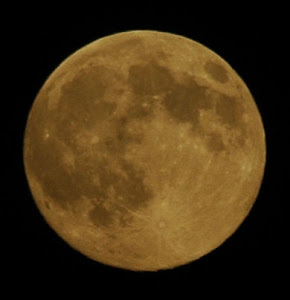 However, the desire to create never went away, so Lucy turned her insomnia into a useful tool—penning her novels in the wee small hours of the night and the stolen moments of the day. Lucy has enjoyed inhabiting worlds of her own creation from a young age. While her initial creations were somewhat dubious, thankfully, her writing grew as she did, becoming more coherent, as well as riveting. Writing has been a lifelong exercise for Lucy, and she loves the process from the beginning inklings of an idea to the care spent editing to craft interesting tales. She takes particular delight in creating worlds that closely overlap reality with key intriguing differences. The odd, the jarring, and the curious are all themes that often feature prominently in her stories. 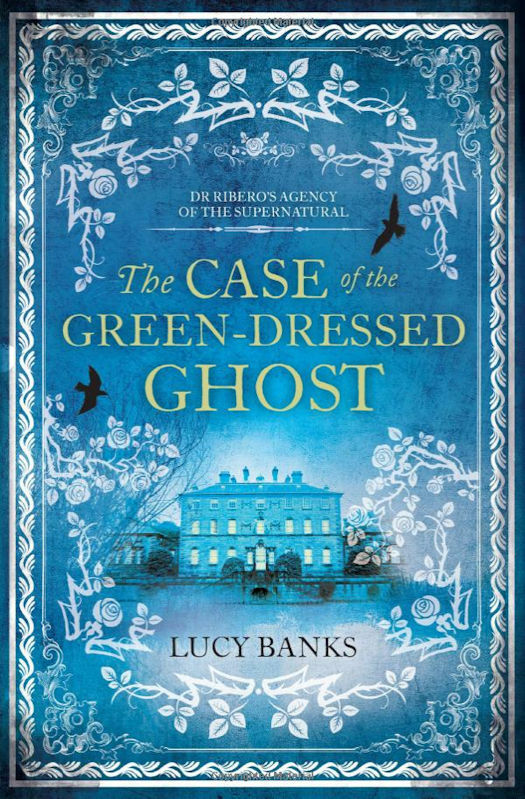 The Case of the Green-Dressed Ghost is Lucy’s first published novel, and the first in a series titled Dr Ribero’s Agency of the Supernatural. The series unites the realm of the strange with the everyday world. It’s a place where chaotic spirits rub shoulders with businessmen, and nothing is quite as it seems.